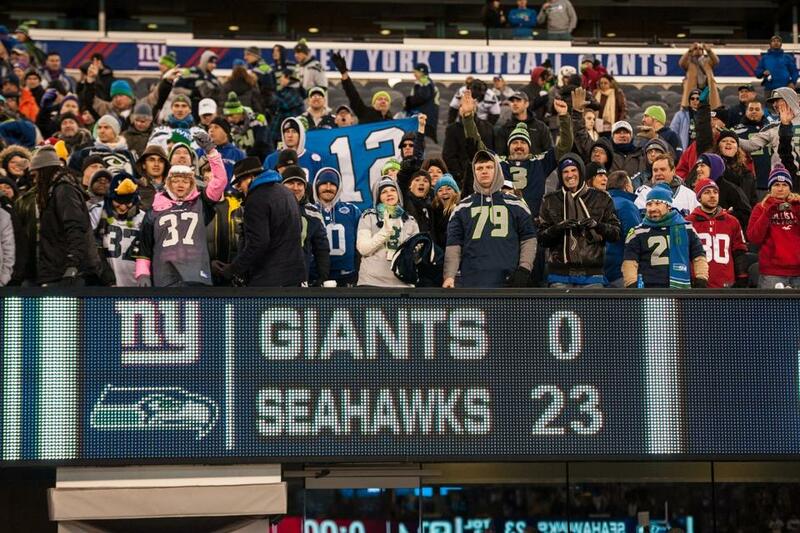 It took the Seattle Seahawks 16 weeks to get to 10 wins a season ago. The Seahawks clinched their second straight 10-win season on Sunday with a 41-20 victory over the Minnesota Vikings; 5 weeks ahead of last season. 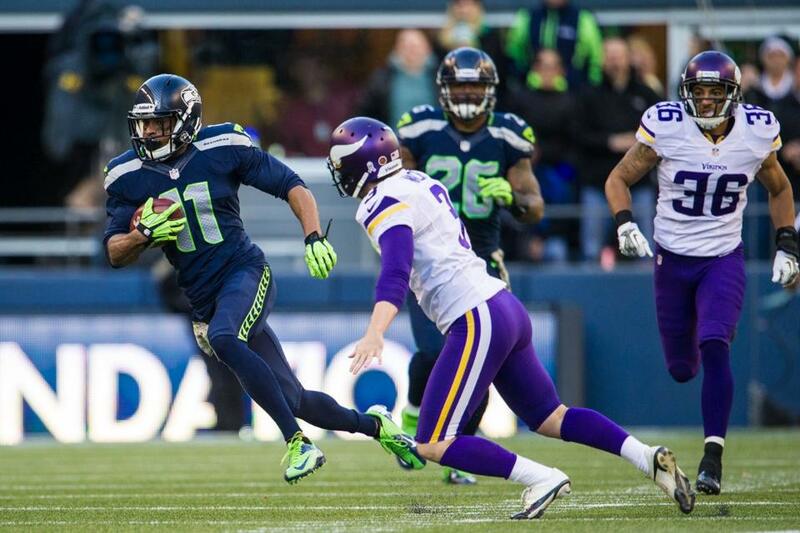 The Seahawks record-best start extends to 10-1 and the Vikings fall to 2-8 on the season. There is a lot to get excited about from around the league to what the Seahawks and the 12th Man have to look forward to upcoming, but let’s take a look back at some of the high points of Sunday’s win over Minnesota. Stopping Peterson: Who would have thought that it would be Toby Gerhart, NOT Adrian Peterson, who led the Vikings in rushing yards this week. The Seahawks held the reigning NFL MVP to 65 yards rushing, while in the process proving that last week’s run defense in Atlanta was not a fluke performance. Peterson’s longest run on the day was a 13 yard run midway through the 3rd quarter. There is no question the Seahawks defense emphasized stopping the run during practice this week but even with a week of preparation to hold the most powerful running back in the league to 65 yards is something to be proud of. Like I talked about in my Vikings preview, the only way realistic way the Vikings could win is if Peterson rushed for a couple hundred yards and multiple touchdowns. Holding him out of the endzone made it very easy for the Seahawks to take control of the game as early as they did. On the whole, the Seahawks defense were successful in making Minnesota’s offense one-dimensional and when Christian Ponder was forced to throw, he made the kind of mistakes that he is known for making (see “winning the turnover battle”). Harvin’s Debut Goes as Expected: In his postgame interviews, Percy Harvin said he recruited his teammates to go up to Head Coach Pete Carroll to convince him to put him in to return kickoffs. Harvin made the most of his single special teams opportunity. With under a minute remaining in the first half, Harvin returned a kickoff 58 yards to set up a 19-yard touchdown pass to Doug Baldwin. Harvin was very explosive and he is incredible at squeezing through blocks. His return got the 12th Man completely fired up and for me personally, it left me pondering what our return game and offense is going to look like in our final 5 regular season games. Harvin’s spark on special teams gives us a huge weapon moving forward but I would not be surprised to see opposing teams either attempt to kick it through the endzone or pooch kick to avoid putting the ball in Harvin’s hands. As a receiver, Harvin only made one catch for 17 yards but he definitely earned style points. Harvin’s catch was tipped one-handed and hauled in as he was falling to the ground to give the Seahawks a first down, continuing a touchdown drive in the second quarter. I expected to see Harvin play 12-15 plays total but he was on the field for 10 offensive plays in the first half alone. Harvin met my expectations I had of him in today’s game and it will be fun to see him on the field full-time for the rest of the season. Lynch Scores 3 Times, Screws My Fantasy Team: Even though I am having a terrible fantasy season, the fact that Marshawn Lynch scored over 24 fantasy points this week did not help me at all. Reality always trumps fantasy however and without Lynch’s performance the Seahawks would have struggled mightily. I would have been out of Skittles by the time Marshawn Lynch was done scoring Sunday. 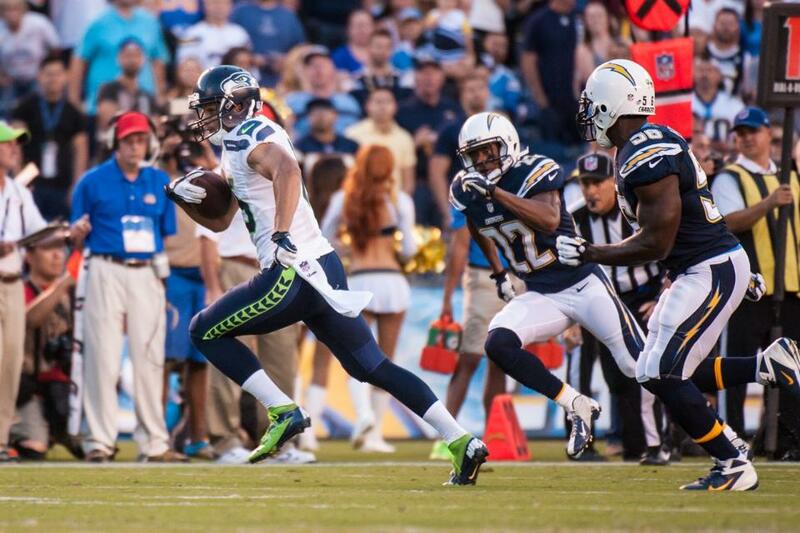 Lynch found the endzone three times and also ran for 54 yards this week. Lynch is currently 2nd among all running backs in rushing yards this season and with a two week break before the end of the regular season Lynch could be primed to make a push for the NFL rushing title. Lynch is currently projected to run for 1,267 yards this season but will most likely need more to claim the rushing title. His motivation towards that feat will directly parallel how we function on offense in the coming weeks. Winning the Turnover Battle: You know how I said that if you can make Christian Ponder throw the ball mistakes are bound to be made? You saw exactly what I was talking about this week. Ponder threw two interceptions and probably should have thrown a third. After dropping a pass thrown right to him, Bobby Wagner made up for that mistake by picking off Ponder later on in the game. Ponder also threw a pick-six right to cornerback Walter Thurmond; his first interception return touchdown of his career. 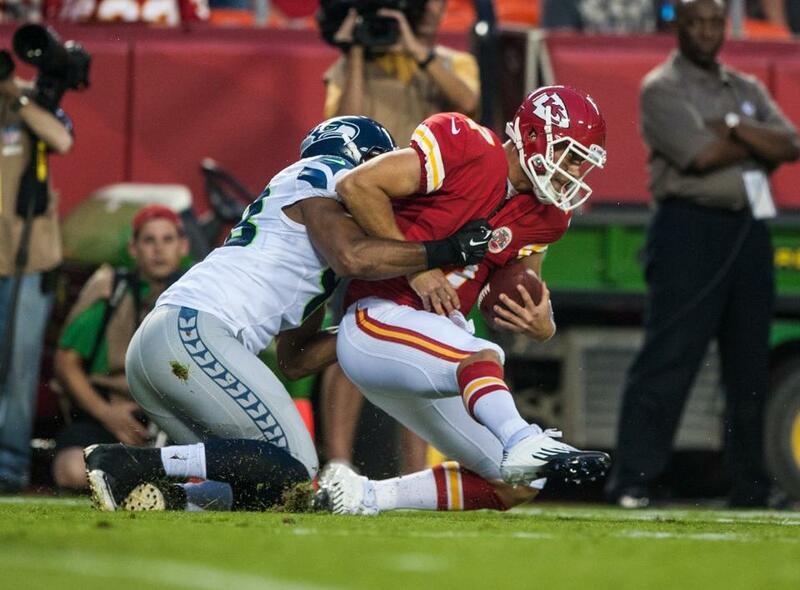 The Seahawks won the turnover battle 4-0 on Sunday and they scored 20 points as a result of those turnovers. The Seahawks now have a plus-11 turnover margin this season which is tied for 2nd best in the league. Thoughts on Minnesota: The Minnesota Vikings have talent but they have a serious need to upgrade the quarterback position. I do not believe Christian Ponder has a successful future in Minnesota and with this lame-duck season coming to an end in 6 weeks, I think Josh Freeman should get an opportunity to start to give the Vikings front office and coaching staff a glimpse to see if Freeman has a future in Minnesota next season and beyond. The Vikings defense has potential to be a really good unit but it doesn’t help when the offense turns the ball over and gives us excellent field position. I do not expect a serious bounce-back from the Vikings next season but they will most likely be primed with a top-5 draft pick in 2014 and I think if one of the elite college quarterbacks is available the Vikings may want to consider drafting the potential future quarterback of their franchise. Random Thoughts: We got to the Hawks Nest Bar at 8:30 in the morning. Almost all of the tables were open when we got there but the place was standing room only by the time 9:45 rolled around… Thanks to the Tacoma guys we met and shared buckets with at the bar this week. One of the guys thinks he is on my flight down to San Francisco in 3 weeks so I’ll have to keep my eye out at the airport. Too bad I don’t really remember what he looks like… No giveaway again this week? C’mon Seahawks… The starting offense was introduced this week and I was hoping to see Percy Harvin get introduced individually. That did not happen though… One of the guys that sit in front of me sold his ticket on NFL Ticket Exchange and some random guy sat in his seat. He did not talk, he did not cheer, and he did not really engage in any celebratory behavior with the rest of us throughout the game. That was pretty odd. I wouldn’t be surprised if he was a tourist who wanted to catch a Seahawks game. I find it pretty odd that someone would buy an individual ticket to a Seahawks game and actually attend rather than sell it to a scalper to try to make some pocket cash. Why would you want to go to a Seahawks game by yourself?… Although it’s expensive, Papa John’s makes really good in-stadium pizza… A guy at the top of our section got kicked out by alcohol enforcement. When I went down to the concourse to refill my water bottle I heard him drunkenly slur to a cop “why exactly am I being kicked out of here, sirs?” Couldn’t help but giggle walking back up to my seats… To the guy in the Charlie Whitehurst jersey, you need a hug bro?… I got to see the end of the San Francisco/New Orleans game in the windows of the Seahawks pro shop and the fans huddling around the windows erupted in cheers when Garrett Hartley kicked the game-winning field goal… The picture of Jim Harbaugh screaming a certain colorful four letter word after that game makes me so happy… We went to the Pyramid Alehouse after the game to grab some food and watch the first part of Sunday Night Football. The fish and chips are stellar but two pieces of fish is not enough for a big guy like me. That was slightly disappointing… I get to watch RedZone for the next two weeks without a Seahawks game on Sunday afternoons. Next Sunday with the ESPN playoff machine on my computer, an ice-cold beer in my hand and RedZone on in front of me, you know where to find me… After the bye: the New Orleans Saints in what is sure to be a raucous playoff-type environment at CenturyLink Field on Monday Night Football. I will be taking a short break from the blog during the bye week but if anything important happens I will hop back on. If not, check back on Sunday, December 1st as I preview the Seahawks game against the New Orleans Saints. Go Seahawks!